Two tanks of gas: $115.00. Four cases of Gatorade: $52.00. Forty-eight endurance bars: $44.00. 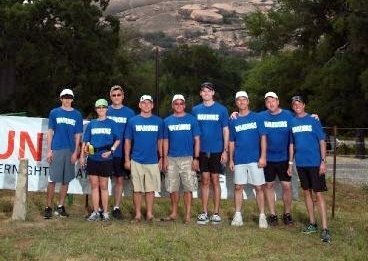 Six guys running 96 miles overnight from Enchanted Rock to Austin: priceless! It was a unique challenge. In a market already fairly saturated with participatory sports events, this one stood out enough so that a group of friends dared each other to do it (call it smack talk or machismo everyone knows that a lot of what happens in middle aged men’s social lives revolves around a dare). Stay up all night? Sure! And run? No problem! We even tried to one up one another by selecting the most difficult legs of the race or offering to run at the most difficult times of the night. Team building and community were emphasized, not winning. The website says, “we are not giving prizes or awards for fastest time so please make safety your team’s #1 priority and make sure we are all together at sunrise on Sunday morning.” Roughly 30 teams of 6-12 runners meet between noon and 6:00 pm at Enchanted Rock State Park near Fredericksburg, TX. The event used a pace per mile handicap system so that the slower teams started first and faster teams started last. That way everyone arrived at Laguna Gloria Museum in Austin at the same time for breakfast. The event was extremely well supported. The organizers had established 17 stages and at the end of each were bathrooms, a lighted area for runner pick up and volunteers to cheer the teams on well into the evening. As we traveled through the night I was quick to notice that the infrastructure provided on a race course that traversed more than 90 miles across three counties and several municipalities was very impressive. Teams were required to raise a minimum $5,000 and fundraising incentives were offered. As a result, $230,000 was raised to help Beyond Batten Foundation. So, you might ask, how did we do? We were the first team to arrive at the finish and a well-deserved breakfast. And although we had finished 3rd we were satisfied with our performance and I was gratifited to have stayed up all night for a great cause! Do you organize a unique fundraising event? What are your tips and tricks of the trade? Tell us your story!